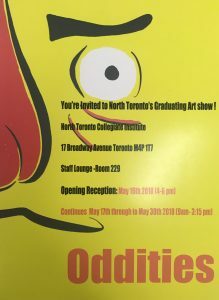 Oddities – NT’s Graduating Student Art Exhibition – opens May 16th 4-6 pm in the NT Staff Lounge and Gallery. The show runs until May 30th. 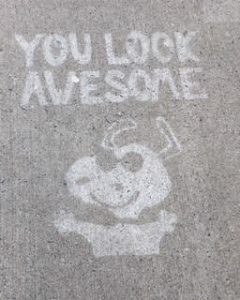 Students enrolled in grade 11 Visual Art were challenged to bring a little sunshine to the rainy spring weather by creating positive street art-inspired stencils to apply to the concrete outside their school with an invisible hydrophobic spray. This means that when wet, the concrete treated with the spray retained its color, while the areas that were not sprayed darkened. After learning about how artistic interventions could be used to inform or change behaviour, students enjoyed turning design lessons on typography into light-hearted inspirational messages to brighten up the next rainy day of our local community passers by. 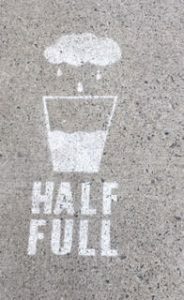 The hydrophobic spray is originally the brainchild of Seattle entrepreneur Peregrine Church at Rainworks, is environmentally friendly and lasts about three months.